Week twelve is in the books! I can not believe that I’ve completed three months of training and just have six weeks until the race! Each week during this training cycle, as I train for the Chicago Marathon, I will share how my training went and what the week looked like. I do this because: 1) I love reading about how other folks train and 2) it’s great for me to have a record of what I did each week. Also, honestly, it helps keep me accountable when I know I’ll be writing about it. I also post almost all of my runs on Instagram as well. A couple weeks ago, I started a link up for Chicago Marathon Training Recaps – I know there are more of us out there so please do link up! I love reading about folks training for the same race as I am, so please do link up! Monday: 5 miles with Caitlin. We had a little adventure run and enjoyed catching up and hanging. I was grateful for the company and the weather was pretty decent so I was definitely grateful for that! Evening Pure Barre class as well. Tuesday: 4×1.5 mile repeats. My watch messed up the lap function, but doing the math kept me occupied. The weather was glorious – 68 degrees and low humidity which felt AMAZING. My overall pace including warm up and cool down was 9:27, which made me pretty happy. This was a strong workout! Wednesday: I took a total rest day for the third week in a row and it was glorious! I’m going to try and keep this day a day of total rest because I think it helps. Thursday: Tempo Thursday. This week I moved up to running NINE tempo miles and a warm and up and a cool down mile for eleven total. I ran mostly by feel, just checking my watch for mileage and surprise, surprise, the tempo miles were all in the same range they’ve been in this whole training cycle. My slowest tempo mile was 9:21 and my fastest tempo mile was 9:08. I was really happy with this run even thought the weather wasn’t nearly as nice as it was earlier in the week. 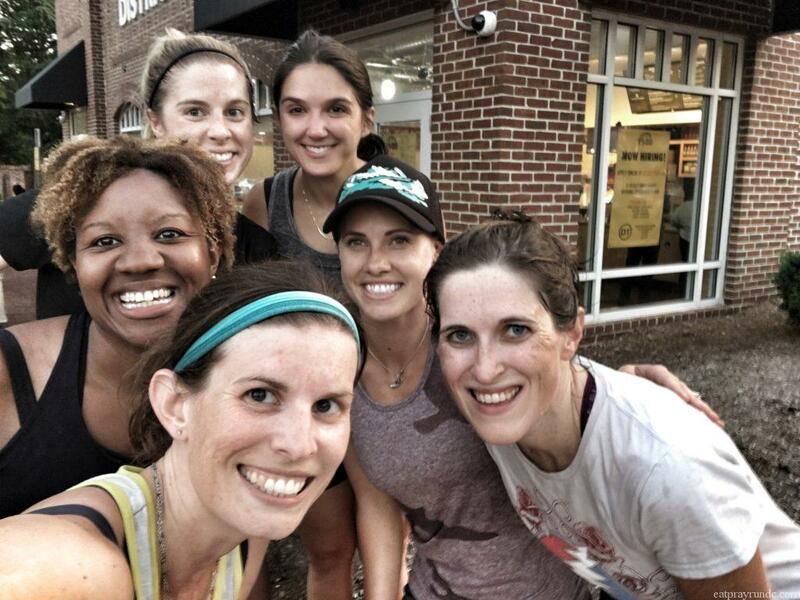 I then ran just over 3 miles that evening for a Oiselle team Flight Club run. Then we ate tacos, because uh, tacos are delicious. Friday: Since I’d run a double on Thursday, I slept in a bit on Friday and ran an easy three. It was hot. Again. Saturday: Eighteen miles. It was hot and this run was hard. This is the longest I will run during this training cycle – Hanson’s prescribes a long run to not exceed 2.5-3 hours and this took me just over 3 hours (3:05 to be exact). I’ve noticed a bit of tightness in the back of my right heel after running so I’ve started icing it and making sure my form is strong and doing some light stretching of the area just to make sure it doesn’t blow up. Because ain’t nobody got time for that, am I right? Sunday: Three recovery miles to end the week. How was your training this week? 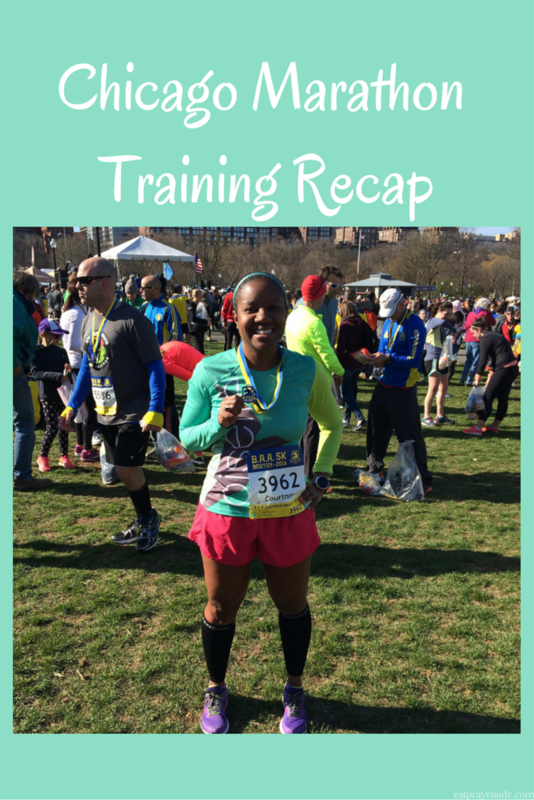 And please don’t forget to join my Chicago training linkup! Are you long running Saturdays then, instead of Sundays? Yep! I’ve always run long on Saturdays! Congrats on another strong week!you are killing your training and I love seeing how consistent you have been! It will pay off on race day, and you only have a month until the taper! Have you been able to get in extra sleep? I think those Wednesday rest days are good for you, both physically and mentally! Keep it up lady! I took a 3 hour nap on Sunday – so that definitely helped, lol. I’m looking forward to sleeping on the 5 hour flight I have later this week 🙂 And thank you! You had another great week! I’m amazed week after week byt your mileage and your paces – great job! Your weekday mileage continues to amaze me. I wish I had the flexibility with work and home to be able to fit in more than 3-4 miles for my weekday runs. Thanks! If I had a teacher’s schedule, there would be no way I could do these long weekday runs – I’d have to run after work. You are doing an amazing job, Kathryn! Sounds like a really strong week! I’m impressed that you had a midweek run of 11 miles. It was tough to get it in, but I felt accomplished afterwards! You are killing it girlfriend! Congrats on another strong week. I hit the big 5-0 this week in mileage and it was glorious! We are almost there!!! Ahhhhh – yay! I can not wait to meet you in October! Way to go on that 5-0 — feels good, huh? Woohoo! Look at these awesome runs! Congrats on being 3 months down and only 6 to go! I am so excited to be getting close!!!! You have been crushing this training. I like hearing about the Hanson’s method because I bought the book and was toying with using it this cycle but didn’t, It must feel great to know you’re longest run is done with! It does! Also I think you would love the plan!! Saturday was brutal – I was impressed you decided to knock out 18. You’ve got some serious mental and physical fortitude. Have fun in Vegas! Well I figured it’d be about 3 hours and I’d be happy for the company. It was not a great run but it got done, which is something! I’m very excited about some vacay and a step back week! Another great week Courtney! You are doing such an amazing job with your training! Great job with your training and awesome miles!! Great job! It’s so hot here long runs are tough. I did 7 on Saturday and that was plenty! I really enjoy following your training. Hanson is tough!!! I used it two summers ago and I give you all the credit in the world for using it this summer. I’m excited to see how Chicago goes for you. Oh my goodness you are going to hit 1.000 miles soon! Amazing. Great job Courtney! I did 11 on Thursday and wow that was enough for me. I cannot wait till taper time.